Hygienists play a central role in your dental health and our in-house plans offer two to four visits a year, according to your needs. Hygienists are best known for professional tooth cleaning, using a range of special pastes and equipment. This is also referred to as a scale and polish, and will remove all traces of plaque and tartar from your teeth and under your gums, even from difficult to reach areas. If plaque and tartar are allowed to build up, they can cause tooth decay and gum disease, so regular hygiene appointments are essential to maintaining your oral health. Gum disease is the leading cause of tooth loss in the UK. It has two stages – gingivitis, which is reversible, and the more serious form, periodontal disease. 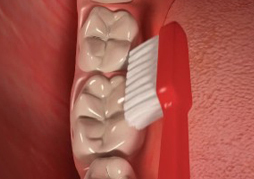 Early symptoms of gum disease include swollen, red gums and blood when you brush or floss. Your hygienist can help to treat gum disease and will provide you with advice to help prevent it happening again. Hygienists can also treat bad breath, a common problem that most people will experience at some point in their life. One of the most common causes of bad breath is decaying bacteria between the teeth, on the tongue and on the palate, and your hygienist can help by professionally cleaning your teeth to remove all bacteria and by recommending products and techniques to use to help stop bad bread recurring. Your hygienist will also provide you with advice about tooth brushing technique, the best type of tooth brush/toothpaste for you to use, and advice on using other products such as interdental brushes to clean between your teeth. They can also advise on how to manage sensitive teeth, as well as providing dietary advice to help you understand how various foods and drinks can affect the health of your teeth and gums. At Burwell Dental Surgery our hygienist also offers treatment with an air polishing device, which can leave your teeth looking several shades brighter without the need for teeth whitening treatment. Please call 01638 741350 to book with Monika. Halitosis is caused by decaying bacteria on the tongue, palate and between the teeth. Our hygienists, Cara and Jenny, can offer advice and help solve or prevent any problems. Gum disease is the UK's leading cause of tooth loss. This is caused by plaque. Gingivitis (inflammation of the gums) is reversible, but if left untreated may turn into periodontal disease – where the bone that anchors the teeth is lost and the teeth become loose. This cannot be reversed but we will advise on improved oral hygiene and off treatment to stabilise damage and prevent tooth loss. With the correct care and maintenance involving the hygienist, extractions can be delayed or even prevented. Hygienists are specially trained in oral hygiene and gum health. As well as personalised advice on the best oral hygiene routine for you, our hygienists check the health of your gums, carry out a thorough cleaning and advise on problems such as sensitive teeth or bad breath. They also have an extensive knowledge of dental products currently on the market and will choose those that are suited to your particular needs. This way you can help maintain a healthy mouth at home.